Johannesburg, Jozi, Jo'burg or Egoli, is the largest city in South Africa by population. It's the provincial capital of Gauteng – the wealthiest province in South Africa, with the largest economy in Sub-Saharan Africa. The city is one of the 40 largest metropolitan areas in the world, and the world's largest city not situated on a river, lake or coastline. And it claims to be the biggest man-made forest in the world! Looking for accommodation special offers and discounts? Here are the latest offers for Gauteng and neighbouring Limpopo, Northwest and Mpumalanga, but to see all offers or filter by location, click here. Johannesburg is located in the eastern plateau known as the Highveld, at an elevation of 1,753 metres (5,751 ft). The original CBD is located on the south side of the prominent ridge called the Witwatersrand and the terrain falls to the north and south. By and large the Witwatersrand marks the watershed between the Limpopo and Vaal rivers. The north and west of the city has undulating hills while the eastern parts are flatter. Johannesburg may not be built on a river or harbour, but its streams are the source of two of southern Africa's mightiest rivers. A number of streams meander through the suburbs of Johannesburg, and form the source of two of southern Africa's primary rivers – the Limpopo and the Orange. Most of the springs from which many of these streams emanate are now covered in concrete and canalised, accounting for the fact that the names of early farms in the area often end with "fontein", meaning "spring" in Afrikaans. Braamfontein, Rietfontein, Zevenfontein, Doornfontein, Zandfontein and Randjesfontein are some examples. When the first white settlers reached the area, they noticed the glistening rocks on the ridges, running with trickles of water, fed by the streams – giving the area its name, the Witwatersrand, "the ridge of white waters". Another explanation is that the whiteness comes from the quartzite rock, which has a particular sheen to it after rain. Johannesburg features a Subtropical highland climate. The city enjoys a dry, sunny climate with late afternoon thundershowers in the summer months of October to April. Temperatures in Johannesburg are usually fairly mild due to the city's high altitude, with the average maximum daytime temperature in January of 25.6°C (78.1°F), dropping to an average maximum of around 16°C (61°F) in June. Winter is the sunniest time of the year, with mild days and cool nights, dropping to 4.1°C (39.4°F) in June and July. The temperature occasionally drops to below freezing at night, causing frost. Snow is a rare occurrence. Regular cold fronts pass over in winter bringing very cold southerly winds but usually clear skies. The annual average rainfall is 713 millimetres (28.1 in), which is mostly concentrated in the summer months. Infrequent showers occur through the course of the winter months. Despite the relatively dry climate, Johannesburg has over ten million trees and it is now the biggest man-made forest in the world. Many trees were originally planted in the northern areas of the city at the end of the 19th century, to provide wood for the mining industry. The areas were developed by the Randlord, Hermann Eckstein, a German immigrant, who called the forest estates Sachsenwald. The name was changed to Saxonwold, now the name of a suburb, during World War I. Early (white) residents who moved into the areas Parkhurst, Parktown, Parkview, Westcliff, Saxonwold, Houghton Estate, Illovo, Hyde Park, Dunkeld, Melrose, Inanda, Sandhurst, now collectively referred to as the Northern Suburbs, retained many of the original trees and have even expanded their forests with the encouragement of successive city councils. In recent years however, deforestation has occurred to make way for both residential and commercial redevelopment. According to the 2011 Census, the population of Johannesburg was 4,434,827 people (although with the East Rand and other suburban areas it's around 7 million). It has one of the highest population growths in SA (click here) which explains why the municipal authority struggles to keep pace. 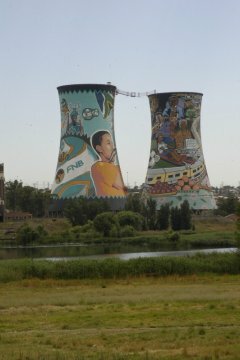 The amalgamation of several towns into Metropolitan Johannesburg was not accompanied with clear branding, and Johannesburg can be very confusing to visitors. Some 29% of Johannesburg residents stay in informal dwellings and 66% of households are headed by one person. Johannesburg, like many other boom towns, grew rapidly and with little planning, and thus the city covers an extremely large area. The main differences between the city's suburbs tend to be socio-economic: The wealthy live to the north of the City Centre in the northern suburbs, while the poor live to the south and on the fringes of the city in townships. The first major modern settlements in Johannesburg were loosely planned, as they grew up quickly in order to service the need for labour in the gold mines on the Witwatersrand. However, the population of Johannesburg increased rapidly and the city quickly established formal neighbourhoods, most of which were racially mixed as labourers lived together. The earliest formal settlement to house people of all races, Kliptown, is located near today's Soweto. The CBD grew rapidly in the early 20th century as many formal European style buildings were constructed, such as the city's main post office. The Central Business District was the first part of the city to be built in a grid, which was designed around the major road known as Commissioner Street, which served as the central artery for the city. During this time period, the city invested in street cars, which mostly served to connect wealthier white suburbs with the CBD. Physical growth, although somewhat limited by transportation, continued quickly as immigration to South Africa, and Johannesburg in particular, increased dramatically. This problem was solved in the 1930s when the automobile was introduced in mass production to South Africa. Automobiles were, for the most part, confined to the wealthy, and permitted them to move to the north of the city and commute into the centre. The South African economy did extremely well at the end of World War II and many new immigrants came to South Africa from Europe. Most poor suburbs were mixed, with poor blacks and whites living together, although the wealthy suburbs were usually reserved for whites. This changed with the election of the National Party in the 1948 elections, who began to formalise the system known as apartheid. Apartheid formally designated which suburbs each race could live in under the Group Areas Act. Consequently, the city was divided into white and black suburbs. The white suburbs were mostly wealthy and well-developed, and located in the nicest areas in the Johannesburg region. Black South Africans lived in poorly developed townships and suburbs out of view of the white suburbs. Many large freeways were built to link Johannesburg with the rest of South Africa, although this permitted the further outward expansion of the city along the N1, N3, and M2 roadways. Public transport construction was completely abandoned, except for a minor bus system. This system continued until the 1980s, when international sanctions and a poor security situation led to a large contraction in the economy. Many companies abandoned skyscrapers that had been built in the CBD in the 1960s and 1970s, and left warehouses empty or little used. When the Group Areas Act was repealed, there was a mass migration of former township dwellers and illegal immigrants to buildings in the CBD and surrounding areas, which caused crime rates to increase dramatically in the Central area of the city. Many businesses that had not closed their CBD offices left for more secured Northern suburbs, and in particular, Sandton. The amount of business and population of the northern suburbs increased exponentially, while the CBD was left empty and abandoned as a "no-go zone". The previous owners of buildings in the CBD abandoned them as their value decreased, and more illegal immigrants moved in. Many suburbs near the CBD also felt the demographic change as previously white and middle class suburbs like Yeoville became mostly black and dangerous within the space of two to three years. The city has grown so quickly to the north that the border between Johannesburg, Midrand, and Centurion is mostly an arbitrary political border, as the two cities have grown together so there is no space between them. If you're going to do it, do it in unassailable style. Situated in residential Rivonia, the insightful and interactive museum experience Liliesleaf honours South Africa's remarkable heritage and the impressive trajectory of South Africa's socio-political past. The Constitution Hill precinct in Braamfontein is the seat of the Constitutional Court of South Africa. If you're searching for accommodation in a specific suburb, please use the search box on the right-hand side near the top of this page. There you can search by specific suburbs. Or if you use Advanced Accommodation Search, you can filter results by price and other requirements. The maps at the bottom of each section locate accommodation establishments in relation to other attractions. Somewhere between the pages of a design magazine and a family home from childhood you'll find The Hillside House. A White House Guest House ~ Luxury, Comfort and Tranquility. Home away from Home ~ With a Dash of Pamper. Solace Guest House and Spa is a B & B which offers a warm and friendly environment, with free Wi-Fi and parking. Enjoy peace, tranquility, warm hospitality and personal service at Acacia House Rivonia. Value for money in a safe upmarket estate, The Baobab will guarantee your return. Centrally located in the heart of Midrand. At Glenalmond Hotel, all our suites are comfortably furnished creating an up market sense of style and elegance. A warm and welcoming guest house located in the leafy suburbs of Johannesburg with close proximity to Rosebank. At the Carlton Panorama you will have some very wonderful views of the city. On the 50th floor of the tallest building in South Africa this will be quite a treat. Be sure to bring your camera with you to take lots of pictures while you are up there on the top floor. Gandhi's contribution to the struggle for liberation and justice has recently been acknowledged by the City of Johannesburg. The site of the city's first courthouse, formerly named Government Square and later Van der Byl Square was renamed in Gandhi's honour in 1999 and a statue erected to commemorate his role in shaping our country in 2003. While some of the square is still used as a bus terminus, banners and a series of information panels in the area tell the story of Gandhi's connection to the city. First National Bank, the historical forerunner of South African banking, has established this museum to depict their journey through South Africa's chequered history since 1838. The gallery is the biggest gallery in the sub-continent, with a collection larger than that of the South African National Art Gallery in Cape Town. Some of the pre-eminent artists in the collection are Pablo Picasso, Camille Pissarro, Claude Monet and Edgar Degas. The comprehensive South African collection includes works by Gerald Sekoto, Alexis Preller, Maud Sumner, Sydney Khumalo and Ezrom Legae. Situated in the heart of downtown Joburg in the award winning Absa Towers, The Absa gallery is attached to a prominent bank and hosts artists who have entered its prestigious, annual fine art competition. The Museum is home to the largest collection of money formerly used in South Africa, as well as housing extensive historical records stretching back to the early origins of Johannesburg. As the only banking and money museum in South Africa, it is the custodian, not only of South Africa’s banking history, but also of the economic, political, and social changes that are often so dramatically reflected in these currencies. Educating young South Africans about banking and finance - From displays of cowrie shells - primitive money from centuries ago - and Venetian glass beads, also once used as a currency - to coins recovered as treasure from sunken ships, all the way through to exhibitions on bank-related crime and how to use an ATM - its collection of over 600 money boxes, some dating back to the early 1800’s, reminds one of the days when young children were taught the wisdom of saving. Situated in the grounds of the South African Institute for Medical Research, in Hillbrow. The Adler Museum houses stimulating exhibits - a pharmacy, doctor's surgery, dental museum, hospital, optometry, video room, coach house and authentic reconstruction of an African Herbalist Shop. Booking is essential for guided tours. One of Gauteng's most recent landmarks, the R53-million Nelson Mandela Bridge, was opened on July 20 2003 as part of the celebrations for former president Nelson Mandela's 85th birthday. This magnificent bridge links Braamfontein in the north to Newtown in the south. The bridge improves direct access into the Newtown Cultural Precinct carrying two lanes of traffic and two sidewalks for pedestrians. The bridge is South Africa's largest cable stayed bridge measuring 284 metres. Definitely one of South Africa's engineering masterpieces. South Africa's foremost receiving house of live entertainment - presenting the very best of world class theatre, sourced both locally and overseas. The theatre expertly balances its recognition as an internationally acclaimed venue for global touring theatre. Built in 1892 as a prison to control the influx of the uitlanders (foreigners) by the then President of the Zuid Afrikaans Republik Paul Kruger the prison then became a Fort after the failed Jameson Raid of 1896 up until 1899 when it became a prison for the second time incarcerating mostly those who were opposed to apartheid the likes of Mahatma Ghandie, Nelson Mandela, Joe Slovo etc.Today it is Museum and it houses the highest court in the land the Constitutional Court a place where human rights are protected. Priceless musical instruments and scores dripping with rich cultural and historical heritage are preserved in this exclusive museum. Please make appointment only. Explore the wonders of the universe, the stars and the planets. Discover Africa’s mysterious past. Themed exhibits cover humanity’s origins in Africa to the San of Southern Africa. A world class theatre that showcases local and overseas productions, providing an opportunity for South African performers, musicians, writers, creative directors, designers and technicians to develop their skills on a sponsored basis in order to create commercially viable and exploitable stage productions. It was designated "store room" on the original plan by the architect Don Leonard but now houses a versatile experimental theatre with its own foyer which also serves as an exhibition space, the venue seats 120. It has established itself as South Africa's major venue for contemporary dance. Annually the FNB Dance Umbrella celebrates its national festival here with top companies from around the country. The entire region's major dance companies have danced here and book seasons on a regular basis. The theatre has 367 seats in an adaptable auditorium. Its foyer contains bar and cafeteria facilities. SA national anthem writer (Enoch Santonga) is buried in this cemetery. A microcosm of South African culture and history which houses a variety of museum displays. The Market Theatre is home to the Rembrandt Gallery showcasing local and international art. The Worker's museum features major photographic exhibitions. The Sci-Bono Discovery Centre provides programs for students and teachers, aimed at translating the 2005 curriculum from theory into practice. The centre is the largest science discovery centre in Africa and focuses on catering for the melting pot of languages and cultures that is Gauteng, thereby creating the necessary environment to enable people from as many different backgrounds as possible to benefit from this educational initiative. Accommodated in Johannesburg's former Fresh Produce Market building in Newtown, MuseumAfrica focuses on the geology, anthropology, archaeology and history of Southern Africa from the Stone Age and up until today. Of relevance to the heritage of the Freedom Struggle are "The Road to Democracy" exhibition (providing an overview of the social and political upheavals of the early 1990's), "Tried for Treason" exhibition (which tells the story of the 1950's Treason Trial and its accused), an exhibition of the life of Mahatma Gandhi (focusing on his life in Johannesburg), and a recreated 1950's Sophiatown scene (complete with Marabi music and Sophiatown fashions). A very informative tour that traces beer's origin some 6,000 years back and demonstrates the beer making process. It also features a pub where visitors can enjoy refreshments after touring the facility. The Southern African Theatre Initiative is a regional organisation formed by theatre practitioners who realised the need to come together and work as a unit for the development of theatre in Southern Africa. S.A.T.I. is a network that works as a central co-ordinating body for Theatre in SADC countries. An old bus shed has been transformed into a dynamic, integrated business co-operative specialising in the manufacture, marketing, sales and export of African inspired craft, jewellery and design products. The Workers' Library and Museum is housed in a restored municipal workers' compound in Newtown. Used until the 1970's, the compound was renovated with one wing being developed as a museum and the other to house meeting rooms, offices and a library. The buildings are a recognised National Monument, and an important part of working class heritage. In 1986, Newtown's Market Square was renamed to honour Mary Fitzgerald, an Irish-born activist who is said to have made a great contribution to the early history of Johannesburg. Her legacy lives on at the heart of the city's Newtown Cultural Precinct, now a great urban space for all city users. Enjoy a relaxing day with the entire family wandering through the 54 acres of lush gardens. The wide variety of wildlife will enthrall and entertain you. Tours are available to enrich your zoological experience and the highly acclaimed night tours allow you to discover the mysterious world of nocturnal creatures. The magnificent collection of aircrafts, armored vehicles, artillery, small arms, medals and uniforms some of which are the last of their kind in the world. The museum includes an extensive research library and archives. Learn theatre skills through music, movement and drama. See the Herbert Baker Architecture in the Parktown-Westcliff area where the Randlords lived. Declared a nature reserve in 1959 it sprouts vegetation indigenous to the Witwatersrand. The archaeological site is of great interest as relics of the Stone Age have been discovered and preserved here. The great wealth of natural and historical knowledge contained in this treasure chest makes it a "must see" for every person. Emmarentia Dam is adjacent to the Johannesburg Botanic Gardens and is a popular fishing spot where anglers come for mirror carp and large mouth bass. Small yachts compete in regattas during the summer months while Duzi-talk abounds when canoeists train for the marathon. The dam is also a favourite spot for sailboard enthusiasts and all types of sun-seekers - in fact the vibe on the dam's shore can often be likened to that of a popular beach at the coast. Food vendors are plentiful over weekends. Alternatively you can bring along your own scrumptious picnic hamper to enjoy under the lush trees. An array of goods from delicious food to hi tech appliances can be found at this permanent flea market. This park is a mix of meticulously tended lawns and fountained terraces. Creative landscaping, traditional gardening methods, splashes of summer colour and subdued carpets of leaves in autumn constitute this botanic masterpiece. The stairways are lined with flowering cherry trees while old wood benches nestle in amongst the silver birches. Sundays herald croquet balls being driven over the green lawns, tea and cucumber sandwiches. Abundant flower beds feature as a backdrop in many bridal photographs while the herb garden remains an attraction to many. If you're an ambler, these splendid gardens must surely be first on your list of intended visits. See and buy beautiful craftwork from all over Africa including pieces from Zimbabwe, Namibia and the Congo. The Rooftop Market is regarded by many as South Africa’s best flea market, and is well patronized by locals as well as tourists. More than 500 stalls offer quality clothing, beautiful ceramics, art and craft objects, antiques and collectibles. A Magnificent Park only 30km from Joburg comprises 200 hectares of grassland and forests. Many species of game can be sighted here. See prides of lions in the lion enclosure their cubs. There is also a petting zoo for the children. An authentic Zulu village is built entirely with material from Zululand right here in Gauteng. The village is an excellent venue for private/ corporate functions, small conferences and product launches. A short, informative tour of the village and an explanation of the Zulu traditions are conducted. Be enchanted by wild antelope and myriad bird life in the indigenous bush and koppies of Joburg City. Go carting is an enjoyable motor sport for anyone hooked on speed. In Johannesburg one can enjoy the rugged terrain with mud, speed, screaming tyres, revving engines and shouting participants. Laps are approximately a kilometer long and the track accommodates up to five carts at a time. Enjoy a mini grand prix, a corporate relay or a standard six to eleven-lap race with friends, Clothing is supplied. All products in this Market are handmade and produced organically, making a trip to this market in Joburg’s north a unique experience. Enjoy cakes, pastries, cheeses and crafts. An indoor climbing gym enables individuals to put on their hiking shoes, strap themselves to a harness and use their hands and feet to climb up an indoor graded wall. It is the next best thing to climbing a mountain, and there is always an instructor on site. South African biggest owl collection also home to variety of big cats. Ponyrides, train trips, motorised bikes, monkeys, sheep, rabbits and birds. A two-toed sloth from South America that likes broccoli, articulated python called Psycho Syd, curled fast asleep alongside his partner Rajah. Most animals and birds are exotic. It has 1700 slot machines and 70 gaming tables. Croc City Crocodile Farm provides the opportunity to observe one of the world's most spectacular predators at close range. You are also given the chance to HOLD a hatchling. On display there are croc hatchlings to large adults of up to five meters in length. The tea garden offers delicious refreshments and in the curio shop you will find a wide variety of souvenirs, as well as vacuum packed crocodile meat. This Market specializes in African Crafts and Curios, which make perfect gifts for tourists and locals alike. Bring your picnic basket and enjoy a farmyard with cows, pigs, ducks and horses. School of Performing Lipizzaner stallions, it was given seal of approval by the renowned Spanish Riding School in Viena. In the early 1960's, Liliesleaf Farm, which is situated in rural Rivonia, provided the perfect "safe house" from which leaders of MK could operate. It was, to all intents and purposes, an operational farm and the black people seen on the farm were, to the world around them, labourers employed to do the farm work. Nobody was aware of the important work that was done here and the place of refuge it provided for the ANC leaders. Nelson Mandela was known as David, a cook and general labourer. But in July 1963, following months of intensive investigation, the security police raided the farm and arrested Walter Sisulu and other members of the MK High Command. The capture of key leaders and the discovery of the plans for operation "Mayibuye", (plans to overthrow the South African Government through violence), led to the well publicized "Rivonia Trial", which resulted in Nelson Mandela and his fellow conspirators being sentenced to life imprisonment. Playtime with farm animals, a jumping castle, jungle gym, trampolines, swings, a mini soccer field, sandpits and a water slide. This is the first house which Ghandie moved into in Johannesburg after two years of a bachelor’s existence and sleeping at the back room of his law office. This is the only house in Johannesburg where the is evidence that Gandhie,even if it was for a brief stint, lived as a father to his three sons and a husband to Kastuba,his wife.Gandhie shared the house with his intellectual, Jewish FRIEND, Henry Polak. This extensive market is based near the Eastgate Shopping Mall, offering everything from clothes to crafts. Live entertainment can be enjoyed as you shop. There is also a Kids' World where youngsters are kept entertained whilst you roam around. The Roman Catholic Church precinct is home to the old St Hubert Church, a beautiful, serene building among a lively district of shops and beer taverns. Nelson Mandela Yard, reached via a narrow alleyway between tightly packed houses, is the room lived in by Madibas in the 1940’s when he was a young lawyer. The Kings Cinema precinct is an art –deco movie house, which captures the style of the 1950’s and forms the centre of an entertainment district which brings Alex together at night. The giant, haunting men’s hostel, designed by the Apartheid authorities to house labourers. The cemetery precinct offers a view of Alex over cleaned up Juskei River, the newer, smarter developments of the East bank. A cultural Centre is to be developed as a one stop cultural precinct where various facilities will be accommodated in the same location. Such facilities will include a museum, a hall of fame and an indoor theater. The centre will be located close to trade and Transport networks. The Alexandra Arts factory will compromise a facility to train and allow productions to be undertaken in Alexandra. The habitat is mainly grassveld with small dams and reed beds at the northern-most end. The vast areas of open grassland in the reserve provide the visitor the opportunity to observe many of the grassland species of Gauteng. The Krugersdorp Museum was established in July 1993 and is housed in the Old Magistrate's Court, one of the town's oldest buildings. The cornerstone was laid on 18 September 1890 by President Paul Kruger of the former 'Zuid-Afrikaansche Republiek'.The Museum officially opened it's doors to the public on 10 January 1995.It's Exhibitions are based on the following themes :The history and cultures of Krugersdorp. Archaeology which emphasises the famous Sterkfontein Caves and other Palaeontological sites in the area, the role of mining in the establishment and development of the town. The geology and geography of the Witwatersrand in the Krugersdorp area. The Mmabana Children's Museum forms an integral part of the Krugersdorp Museum. The words 'Mmabana' means 'Mother of children' and implies that the children's Museum focus on teaching children their cultural values through playing, like a mother teaching her child. This is the gateway to the world heritage sites found here. Visitors walk through the market place and up to the Tumulus building, which is designed to look like an ancient burial mound from the front, however upon exiting, the visitor looks back at a very modern structure. The architecture is symbolic of the journey through the evolution of life which is told within the underground visitor attraction. The journey begins on an underground lake, through elemental forces, emerging at the beginning of the world and continuing through an interactive and an educational experience highlighting the history of the world and humankind. World famous fossils finds include Mrs. Ples, the Taung child and Little foot.Homid exhibition, family restaurant, night and scientific tours. The Rhino Nature Reserve is a privately owned game reserve situated in the "Cradle of Humankind", a declared World Heritage Site. The reserve covers an area of approximately 1000 ha. Good gravel roads traverse the area and take visitors to excellent vantage points from where one can look down on the picturesque Kromdraai valley. This renowned reserve is considered a member of the Johannesburg's Big Five Tourist Destinations and has been nationally praised for their continued effort and subsequent success in various breeding programmes such as breeding white rhinos, Bengal tigers and white lions to name but a few. On a typical game drive the visitor should be able to view more than 20 different species of game including white rhino, buffalo, giraffe, hippo and lion. Open daily from 8h00 - 17h00. Pre-booking for game drives and overnight accommodation is essential but luxurious facilities are available for day-visitors. This is a glass wonderland where you can watch the art of glass blowing at work and buy handmade recycled glassware. There are shops to browse around and visit the restaurant, Zest. Against the backdrop of the magnificent Witpoortjie Waterfall, this Garden covers almost 300ha of landscape and natural veld areas, consisting of mosaic of grassland and savanna, with dense bush in kloofs and along streams. The variety of habitats accommodates over 600 naturally occurring plant species. A breeding pair of majestic Verreaux’s Eagles nest on the cliffs alongside the waterfall, and the garden is home to 220 bird species and a number of reptile and a small mammal, including small antelope and jackal. Home to 250 traders, the Hillfox Market has a reputation for great bargains, with top brands selling for up to 50% less than normal retail prices. Situated in the Swartkop hills of the Cradle of Humankind - Open landrover viewing. There is a restaurant on premises and accommodation available. lodges, artists and crafters, as well as adventure activities. Marty De Kock has run Airtrack Adventures for more than 12 years, flying over 45 000 happy passengers. We conduct sunrise flights daily over The Cradle and travel throughout South Africa entertaining corporate groups at a number of different venues. Game viewing by balloon is our speciality. Zebra and Giraffe wander around the hotel grounds. Accommodation in thatched bungalows, all with two bedrooms & verandah, satellite TV & M-Net. Guided game drives are conducted in open land-rovers. Sunday Barbeque Buffet Mzumba Tribal Dance Conferencing, Functions & Weddings, Authentic Zulu Village, Enquire about paddle boats & canoeing. Children welcome. Lesedi is a charming, authentic and earthy African experience in the heart of the bush, only 25 mins from Pretoria or Johannesburg; you will find a cultural village with exciting traditional dance display, craft market, pub, restaurant, function venue, conference centre and overnight accommodation in African theme guest suites. One of the first goldmines on the Witwatersrand, dating back to 1881. Guided tours on the hour. Last tour 16.00. Tuesday - Friday by appointment only. Special rates for large groups and schools. 3000 hectare Nature Reserve incorporates The Cradle Restaurant & Forest Camp. Open Tuesday - Saturday for a A la carte and a three-course Sunday lunch. We offer catered picnics, boma and cellar functions, conferences, weddings, game drives, and guided walks. Accommodation is self-catering. Your hosts Mark, Flip and Suzie invite you to a living museum. Unique accommodation in beautifully restored oxwagons. A Private Hideaway for Nature Lovers, Bush Indabas and Conference Facilities. Weddings and Function Venue. Splash / Dip Pool. Rucksack Inn. Nature Trail and Nature Museum. "Most nicely decorated cave in South Africa". A natural wonder 2 200 million years old, cave pearls, formations of up to 15m, rim stone pools, picnic area, kiosk, curio shop, stalictites & stalagmites, abseiling by booking only. Entry by lift - no crawling necessary. Traditional bush Pub/Pizzeria opening early 2004. Come and experience a spectacular South African sunrise, occasionally skimming treetops or simply drifting peacefully across the skies. Hot air ballooning is a must for everyone, from the daring adventurer through to the romantic connoisseur. Revel in miles and miles of Africa as you float upwards in this majestic craft, enjoyed by enthusiasts across the world. AirVentures is a licensed non-scheduled air transport service. Sip champagne as you drift silently in a hot air balloon over the scenic Magalies River Valley near Hartbeespoort Dam. An unforgettable experience for individuals and corporate groups. Consider dinner and overnight at one of our top-class "Select Ballooning Lodges" the night prior to flying. Situated at the foot of the Magalies, Bullen's Bush Lodge offers chalets & a tented camp, sleeps 2 or 4. Self-catering or meals in our boma, pub or Restaurant-area. Outdoor entertainment area & splash pool. We're close to all activities in the area and can arrange hiking, golf, fishing, paintball, etc. We also cater for Batchelor parties & functions. Qualified medic on premises. Come and see some of the biggest crocodiles in South Africa! You are given the chance to HOLD a croc hatchling, pythons and other fascinating reptiles. The tea garden offers delicious refreshments and in the curio shop you will find a wide variety of souvenirs and vacuum packed crocodile meat. Come and join us for a fun filled day with adventure!!! Take off the shoes, relax, enjoy, have a braai and rewind mind & soul... Go-Karts, Paint Ball, Kids Play Centre, Swimming Pools, Pony Rides, Volley Ball. Available for teambuilding, parties etc. Nestled in unspoiled bush and home to 6 African Elephants - each with their own character. Sleep next to the Elephants in our exclusive 10 bed lodge and ride an Elephant into the mountain on the morning walk. Enquire about our different programmes to walk with, touch and feed the magnificent African Elephant. This is a unique venue for corporate groups, conferencing and teambuilding. Only 30 minutes from Johannesburg & Pretoria, at the foot of the Zwartkops Mountains lies Glenburn Lodge. 100 room hotel with accommodation options ranging from family chalets, to hotel rooms and exquisite garden suites. Conference and wedding facilities available. Plenty of recreational facilities including putt-putt, mountain hiking, river fishing. 2 Chapels, wine cellar, live music and big screen facilities. Great Sunday lunch buffets and Hot Air Ballooning. Set in the majestic Hekpoort valley, "InTheGorge" is a must see, must do kind of place.We have the following facilities available - quad track, 4x4 obstacle course, paintball, swimming pool and braai facilities. We also do catering and planning for special events.Join us for a fun filled day of endless adventure, as we whisk you away from the daily hustle and bustle. A houseboat charter on the Hartbeespoort Dam is a unique experience. It's the perfect romantic getaway for a couple, tremendous for a family holiday, idyllic for honeymooners, outstanding for fishermen and birders, great for groups and fantastic for friends. Our boats have everything you might need. Just bring your clothes, food and towels. Lovely garden setting situated on the R512/N14(R28) highway intersection with ample safe parking. Owner manager Andre with years of golfing experience able to assist with basic coaching. Our driving range is 300m & we also have a putting green. Refreshments available. Good outing for families with trampoline available. Outdoor challenges for the WHOLE FAMILY! Elemental Maze - 1.5 km of pathways, 4 secret gardens to find. Hay-Bale maze. Rope Maze. Maize Maze (from December) - 3km of pathways. Theme for 2005/2006 Pirates and Mermaids! Wonderful family outing & great for team-building. Kids parties & school tours. Don your swimming kit, lather yourself in sun cream, and gather your wits about you and head on down to Paddle Power Adventures. Both novice and experienced canoeists guaranteed good fun and a wet workout on grade 1, 2 and 3 rapids - all within a short drive of the city. Half day, full day and 2 day rafting trips. A day trip on the river covers roughly 18km with no less than 20 rapids with a scrumptious picnic lunch served alongside the river. We also offer hiking trails, mountain biking trails, horse trails, flat water canoe trips, camping, fishing, tubing and caving, team building & school outings. Paddle Power's members are both active committee members of the Crocodile River catchment management forum. The best DAM parties in AFRICA . We offer tailor-made sundowner cruises ideal for company functions, bachelor parties, conferences and special occasions or just cause you wanna....! Step 100 years back in time... Experience history, wildlife and pure getaway bliss. Only 11 suites ensure an intimate ambience. With acclaimed on site chapel and conference rooms (22 delegates) and main lodge with bar, dining room, lounge and pool. You will be amazed by our history museum, century old artifacts and oxwagon collection. The Rusty Hook Restaurant is a thatched country restaurant situated in the most tranquil of surroundings. Built on top of a dam it offers spectacular views and breathtaking sunsets. Lunch and dinner is served from Tuesday to Sunday and Public Holidays. A full spread breakfast is available on weekends and Public Holidays. Bookings are essential especially on weekends. Accommodation in en-suite rooms. We cater for weddings and all types of functions . Flyfishing on the dam. We guarantee a memorable horse hike or bike ride though a nearby reserve where many bird & animal species can be seen. Tuition, overnighters, champagne breakfasts, moonlight, and novice outrides are organised regularly. Our quaint pub & restaurant welcomes all & is available for any type of private function. Experience the authenticity and variety of Traditional Shaolin Kung-fu in beautiful and tranquil surroundings. Tai Chi and Sparing classes also offered.